Portland, Oregon — The North Carolina Courage stunned a record-setting crowd of 21,144 at Providence Park, defeating Portland Thorns FC 3-0 to win the 2018 NWSL Championship. The Courage hoisted their third trophy this season after claiming the NWSL Shield and ICC Tournament title earlier this season. The Courage become the first NWSL team to ever win the Shield and also win the NWSL Championship. Courage forward Jess McDonald was named Most Valuable Player of the match, after scoring twice on the day. Debinha also scored for the Courage. McDonald not only put away her chances, but also created chances on Saturday, finishing with four chances created and eight shots. The veteran finished the year with 10 goals and a league-leading eight assists. Before McDonald scored her first of the night, Debinha stunned the sea of red at Providence Park with an early goal. Courage forward Crystal Dunn played a dangerous ball through the center of field and into the path of Lynn Williams. Williams was able to break free after center back Emily Menges and Emily Sonnett miscommunicated on the play. Williams’s shot deflected off Menges and hit the crossbar, falling into the path of Debinha, who was able to head it home for the 1-0 lead in the 13th minute. For the Thorns, they have come from behind in their last two matches after falling behind early. In the NWSL semifinal match vs. Seattle Reign FC, the Thorns trailed by one goal early, but rallied to advance to the championship for the second-straight year. But that was not the case on Saturday afternoon. In the 29th minute, strong individual work from Christine Sinclair gave the home side one of their best chances on the day, but her shot went just wide. Sinclair finished the match with two shots, and finished the season with nine goals and seven assists. “Sitting here right now, just not many people get the chance to play a championship game in front of their home fans,” the Thorns captain said in the postgame press conference. “The fans were incredible again today.” The 21,144 in attendance made Saturday’s game the most attended women’s professional soccer championship match in U.S. history. 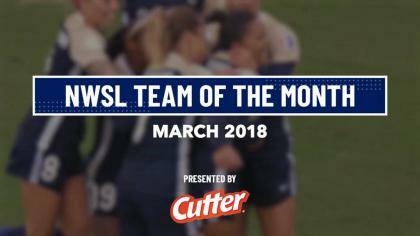 The Courage set regular season records for wins (17), points (57), most goals scored (53) and fewest goals allowed (17) this season and their points per game average of 2.375 is the best in in American women’s professional soccer history, besting the previous record set by the 2011 Western New York Flash of Women’s Professional Soccer. In the postseason, they went 2-0,and outscored their opponents 5-0. “I don’t think we can claim the underdog anymore, I think that one’s gone,” Riley said, laughing. McDonald extended the Courage’s lead by two in the 39th minute, finishing off a one-time service from defender Jaelene Hinkle. The play started with a free kick service from defender Abby Dahlkemper from the right side of the pitch. Dahlkemper’s ball was driven into the box, but bounced out. Hinkle sent the ball back in and behind the Thorns’ defense. McDonald, on her own island with the Thorns’ caught up after the initial clearance, headed it past Thorns goalkeeper Adrianna Franch for her ninth goal on the year. McDonald’s second goal started from a corner kick chance for the Courage. Dahlkemper and Denise O’Sullivan combined for a short corner, then played it back to defender Merritt Mathias, who was creeping from the right side of the pitch. Mathias took a one-time strike and it went directly to the head of McDonald, who wasn’t marked, and McDonald headed it past Franch for the 3-0 lead. The Thorns, although demonstrating solid chances through 2018 NWSL MVP Lindsey Horan all game, couldn’t find that golden chance like Sinclair said her side has been fortunate to find down the final stretch of the season. Sinclair and Heath both had good opportunities in the second half, but Courage goalkeeper Katelyn Rowland made three saves in the second half to keep the clean sheet. Heath, who finished the season with seven goals and seven assists, had a team-high five shots on the day and created three chances. The Thorns close out their 2018 campaign with a 13-7-6 overall record (12-6-6 in the regular season). The Courage finish the regular season at 19-1-6, with 58 goals scored and just 17 allowed. Match ends, North Carolina Courage 3, Portland Thorns 0. Second Half ends, North Carolina Courage 3, Portland Thorns 0. Substitution, Portland Thorns. Midge Purce replaces Ellie Carpenter because of an injury. Substitution, North Carolina Courage. Darian Jenkins replaces Jessica McDonald. Attempt saved. Lindsey Horan (Portland Thorns) right footed shot from outside the box is saved in the centre of the goal. Assisted by Andressinha. Substitution, North Carolina Courage. Heather O'Reilly replaces Crystal Dunn. Offside, Portland Thorns. Emily Sonnett tries a through ball, but Caitlin Foord is caught offside. Jessica McDonald (North Carolina Courage) wins a free kick in the defensive half. Attempt missed. Caitlin Foord (Portland Thorns) right footed shot from outside the box is close, but misses the top right corner. Assisted by Emily Menges. Andressinha (Portland Thorns) wins a free kick on the right wing. Attempt blocked. Lindsey Horan (Portland Thorns) right footed shot from outside the box is blocked. Assisted by Tobin Heath with a headed pass. Attempt missed. Christine Sinclair (Portland Thorns) left footed shot from outside the box is high and wide to the right. Attempt blocked. Tobin Heath (Portland Thorns) left footed shot from the centre of the box is blocked. Assisted by Meghan Klingenberg. Attempt missed. Lynn Williams (North Carolina Courage) right footed shot from outside the box is high and wide to the right. Assisted by Debinha. Corner, Portland Thorns. Conceded by Katelyn Rowland. Attempt saved. Christine Sinclair (Portland Thorns) left footed shot from outside the box is saved in the top centre of the goal. Assisted by Tobin Heath. Corner, Portland Thorns. Conceded by Jaelene Hinkle. Attempt missed. Tobin Heath (Portland Thorns) right footed shot from outside the box is close, but misses to the right. Assisted by Christine Sinclair. Substitution, Portland Thorns. Andressinha replaces Ana Maria Crnogorcevic. Attempt missed. Jessica McDonald (North Carolina Courage) right footed shot from the centre of the box is close, but misses to the right. Assisted by Jaelene Hinkle. Jessica McDonald (North Carolina Courage) is shown the yellow card for excessive celebration. Goal! North Carolina Courage 3, Portland Thorns 0. Jessica McDonald (North Carolina Courage) header from very close range to the centre of the goal. Assisted by Merritt Mathias with a cross following a corner. Corner, North Carolina Courage. Conceded by Adrianna Franch. Attempt saved. Lynn Williams (North Carolina Courage) right footed shot from the centre of the box is saved in the bottom right corner. Assisted by Jessica McDonald with a cross. Attempt missed. Jessica McDonald (North Carolina Courage) header from the centre of the box is high and wide to the left. Assisted by Jaelene Hinkle with a cross. Attempt missed. Jessica McDonald (North Carolina Courage) header from the centre of the box misses to the right. Assisted by Lynn Williams with a cross. Crystal Dunn (North Carolina Courage) wins a free kick in the defensive half. Attempt missed. Debinha (North Carolina Courage) header from the centre of the box is too high. Assisted by Jessica McDonald with a cross. Attempt blocked. Debinha (North Carolina Courage) right footed shot from outside the box is blocked. Assisted by Jessica McDonald with a cross. Attempt saved. Tobin Heath (Portland Thorns) left footed shot from the left side of the box is saved in the centre of the goal. Attempt missed. Celeste Boureille (Portland Thorns) header from the centre of the box is high and wide to the left following a corner. Corner, Portland Thorns. Conceded by Abby Erceg. Ana Maria Crnogorcevic (Portland Thorns) wins a free kick in the defensive half. Foul by Crystal Dunn (North Carolina Courage). Delay in match Adrianna Franch (Portland Thorns) because of an injury. Offside, Portland Thorns. Caitlin Foord tries a through ball, but Meghan Klingenberg is caught offside. Attempt missed. Lynn Williams (North Carolina Courage) left footed shot from the centre of the box is close, but misses to the left. Assisted by Jessica McDonald. Goal! North Carolina Courage 2, Portland Thorns 0. Jessica McDonald (North Carolina Courage) header from the centre of the box to the centre of the goal. Assisted by Jaelene Hinkle with a through ball following a set piece situation. Attempt missed. Jessica McDonald (North Carolina Courage) header from very close range is close, but misses the top right corner. Assisted by Jaelene Hinkle with a cross. Attempt missed. Samantha Mewis (North Carolina Courage) right footed shot from the right side of the box is close, but misses to the right following a set piece situation. Foul by Ellie Carpenter (Portland Thorns). Attempt saved. 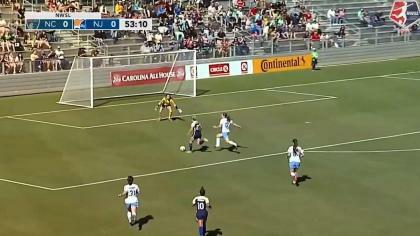 Denise O'Sullivan (North Carolina Courage) right footed shot from the right side of the box is saved in the bottom right corner. Assisted by Debinha. Attempt missed. Celeste Boureille (Portland Thorns) left footed shot from the left side of the box is high and wide to the left. Assisted by Caitlin Foord with a cross. Hand ball by Tobin Heath (Portland Thorns). Attempt blocked. Lindsey Horan (Portland Thorns) header from the centre of the box is blocked. Assisted by Tobin Heath with a cross. Corner, North Carolina Courage. Conceded by Ellie Carpenter. Attempt missed. Jessica McDonald (North Carolina Courage) header from the centre of the box is close, but misses to the right. Assisted by Jaelene Hinkle with a cross. Attempt missed. Crystal Dunn (North Carolina Courage) right footed shot from outside the box is high and wide to the right. Assisted by Lynn Williams. Goal! North Carolina Courage 1, Portland Thorns 0. Debinha (North Carolina Courage) header from very close range to the high centre of the goal. Attempt blocked. Lynn Williams (North Carolina Courage) left footed shot from the left side of the box is blocked. Attempt blocked. Tobin Heath (Portland Thorns) right footed shot from outside the box is blocked. Assisted by Caitlin Foord. Attempt missed. Ana Maria Crnogorcevic (Portland Thorns) right footed shot from the left side of the box misses to the left. Assisted by Lindsey Horan. Attempt blocked. Denise O'Sullivan (North Carolina Courage) right footed shot from outside the box is blocked. Attempt blocked. Jessica McDonald (North Carolina Courage) right footed shot from the left side of the box is blocked. Assisted by Denise O'Sullivan. Attempt missed. Lynn Williams (North Carolina Courage) right footed shot from outside the box is close, but misses the top right corner. Attempt blocked. Crystal Dunn (North Carolina Courage) right footed shot from outside the box is blocked. Attempt missed. Debinha (North Carolina Courage) left footed shot from the centre of the box is close, but misses to the right. Attempt missed. Tobin Heath (Portland Thorns) right footed shot from outside the box is close, but misses to the left. Assisted by Lindsey Horan. Tobin Heath (Portland Thorns) wins a free kick in the attacking half.